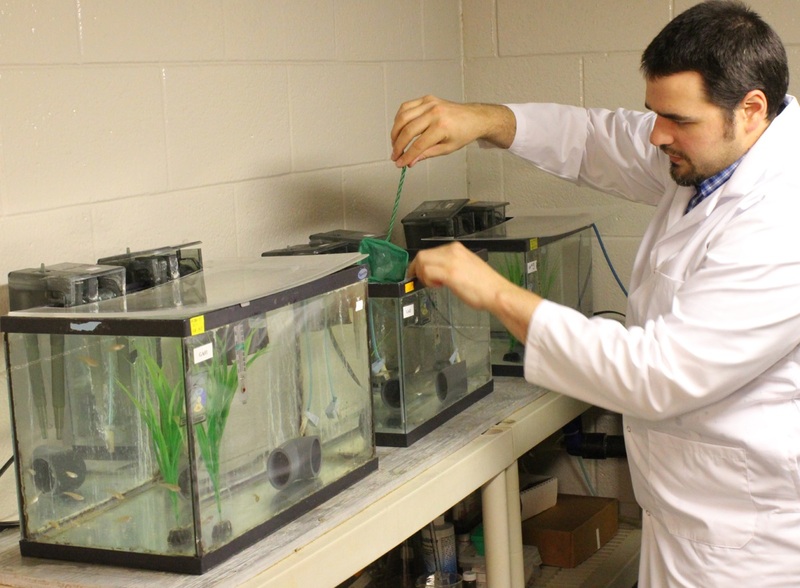 Diluted bitumen, also known as dilbit, a mixture of oil sands bitumen and natural gas dilutants can seriously harm fish populations, according to research study at Queen’s University and the Royal Military College of Canada published this week. 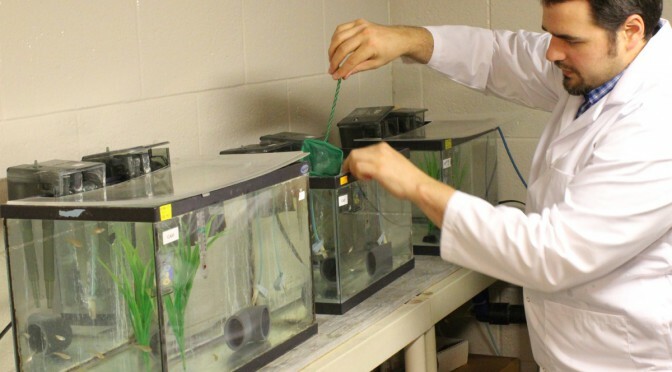 At toxic concentrations, effects of dilbit on exposed fish included deformities and clear signs of genetic and physiological stress at hatch, plus abnormal or uninflated swim bladders, an internal gas-filled organ that allows fish to control their buoyancy. Exposure to dilbit reduces their rate of survival by impairing their ability to feed and to avoid predators. Embryo toxicity of dilbit was comparable to that of conventional oils. Developmental malformations increased with increasing dilbit concentrations. AWB dilbit exposure was not lethal to medaka, but resulted in a high prevalence of blue sac disease (BSD), impaired development, and abnormal or un-inflated swim bladders. Blue sac is a disease of young trout and other salmonid species; usually caused by unsuitable hatchery water. It turns the yolk sac bluish and is thought to be caused by a lack of oxygen. The research was funded by Fisheries and Oceans Canada’s National Contaminants Advisory Group and the next stage will determine whether fish species native to Canada will be affected by dilbit exposure. The work also includes the development of genetic markers of exposure to dilbit and toxicity that could be used to assess whether wild fish that survive a spill are still affected. The research team includes Dr. Valérie Langlois (Environmental Studies, Royal Military College of Canada) and Dr. Barry Madison (Royal Military College of Canada). Dr. Hodson is also a member of a Queen’s research team tasked to determine whether dilbit spilled into rivers would contaminate bed sediments, specifically areas where fish such as salmon, trout, chars, whitefish and graylings spawn, to the extent that the survival of their embryos would be affected. The research was published in ScienceDirect and is one of the first studies of dilbit on young fish. The finding could be significant because both the proposed Northern Gateway pipeline and the proposed Kinder Morgan expansion will cross areas near spawning streams. District of Kitimat Council Monday endorsed, in a six to one vote, publisher David Black’s proposal for a refinery at Onion Flats north of Kitimat. That the District of Kitimat write a letter to the Prime Minister, copying the Premier of BC, endorsing Mr. David Black’s Kitimat Clean refinery proposal and asking that it be supported by senior levels of government, thereby reducing environmental impacts and risks associated with the Northern Gateway, while significantly increasing economic value-added and associated taxation benefits to the Pacif Northwest, BC and Canada. Before the vote, Black made a presentation to Council outlining details of the proposal. Black will be hosting a public meeting on the proposal at Riverlodge at 7:30 p.m. Tuesday. Things are heating up in Kitimat as the April 12th Enbridge plebiscite gets closer. Assumptions have been made, and accusations hurled at Douglas Channel Watch for being an anti-development organization, and nothing could be further from the truth. Our group formed because of our shared concerns regarding Enbridge’s history of spills and their Northern Gateway dual pipeline and supertanker port proposal. We have not stood in the way of any other project currently being proposed in Kitimat. Many of us believe the tar sands should be refined in Alberta, thereby creating thousands of jobs for Canadians. Royalties and taxes garnered could fund research for better, cleaner energy solutions. The stone age didn’t end because they ran out of stones, it was because of the bronze age…we could utilize our tar sands in a wiser, forward looking way which could put Canada at the very forefront of cleaner energy systems into the future. When you lay down on an issue, you get stepped on. Douglas Channel Watch prefers to stand firm with our conviction to protect the place we love, stare Enbridge and the Federal Government right in the eyes, and ask the hard questions while also demanding solid evidence, and will not apologize for doing so. The JRP figures temporary foreign workers can build pipelines in Canada, that Enbridge’s project should be for the export of unrefined, raw, diluted bitumen, and that the Exxon Valdez and Kalamazoo spills, if they happened in BC’s salmon rivers or onto our pristine north coast, would be “justified in the circumstances”. I, and many others, intend to send a massive, clear message to Ottawa that Enbridge’s Northern Gateway is a bad deal for Kitimat, for BC, and for all of Canada. They need to rethink their priorities, and why we are voting NO! to Enbridge. 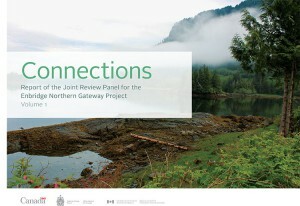 The federal government’s main consultation with First Nations on the Northern Gateway Joint Review Panel report is limited to just three simple questions that had to be answered within 45 days, according to documents seen by Northwest Coast Energy News. That despite the fact that the first volume of the JRP report “Connections” is 76 pages and the second volume “Considerations” is 418 pages including the 209 recommendations and appendices and came after two years of hearings and tens of thousands of pages of evidence. On Dec. 6 and again on Dec. 16, 2013, just prior to the release of the Joint Review Panel report, Brett Maracle, Crown Consultation Coordinator at the Canadian Environmental Assessment Agency for the Northern Gateway project wrote to the First Nations potentially affected by Northern Gateway, saying their response had to be filed within 45 days of the release of the JRP. Since the report was released on December 19, 2013, that made the initial deadline January 31, 2014. The letter also told the First Nations that if they wanted their positions included in the “Crown Consultation Report” that would be part of the package on Northern Gateway presented to the federal cabinet, that position had to be limited to just two to three pages “given the number of groups involved” with a final deadline of April 16, 2014. Maracle’s letters used the term Phase IV to define the post JRP consultations, implying there were three earlier stages of consultation, something many First Nations have disputed, especially since the Harper government had earlier maintained that the JRP itself was the constitutionally mandated consultation. The cabinet has until June 19, 2014, 180 days after the release of the report to approve the issuing of the federal permits for the Northern Gateway project. Consultation with First Nations on projects such as the Northern Gateway is required by the Constitution and has been upheld by the Supreme Court of Canada. Does the Report appropriately character the concerns you raised during the JRP process? Do the recommendations and conditions in the Panel Report address some/all of your concerns? Are there any “outstanding” concerns that are not addressed in the Panel Report? If so, do you have recommendations (i.e proposed accommodation measures) how to address them? The third question appears to confirm what most political observers have said, approval of the Northern Gateway by the Harper cabinet is a a forgone conclusion, since Maracle speaks of “accommodation measures.” When the JRP approved the Northern Gateway project, the panel said that Enbridge’s proposed “mitigation” measures in case of a spill were adequate, something environmental groups and First Nations are now disputing in court. It appears from the correspondence seen by Northwest Coast Energy News, that the federal government will only consider further specific consultations with First Nations after the approval of the Northern Gateway and only then on the implementation and construction process, rather than consulting on the project as a whole. The Haisla Nation needs to understand Canada’s views of the role that future federal decisions might play for the proposed project. In its December 12, 2013 to Mr. Maracle, the Haisla Nation asked the federal government to provide a comprehensive list of the regulatory permits which would be issued the the federal government decision-makers in Haisla Nation Territory in the event the proposed project is approved and describe the consultation process that would occur prior to decisions being on those regulatory permits, within 45 days of the issuance of the JRP Report. Mr. Maracle’s January 29, 2014 [reply] suggests that the only future federal decisions on the proposed project which may entail consultation are specific watercourse crossing and fish habitat destruction permits issued by Fisheries and Oceans Canada. What Canada should have realized is that it has a very real obligation to consult with the Haisla Nation at the deepest end of the consultation spectrum that cannot be pigeon-holed into a one size fits all approach. Further, the term whole-of-government is misleading, as this approach actually prohibits the majority of government from engaging in consultation. Further questions at federal government witnesses during the JRP process confirmed that federal departments had not met with the Haisla Nation since the commencement of the JRP process. 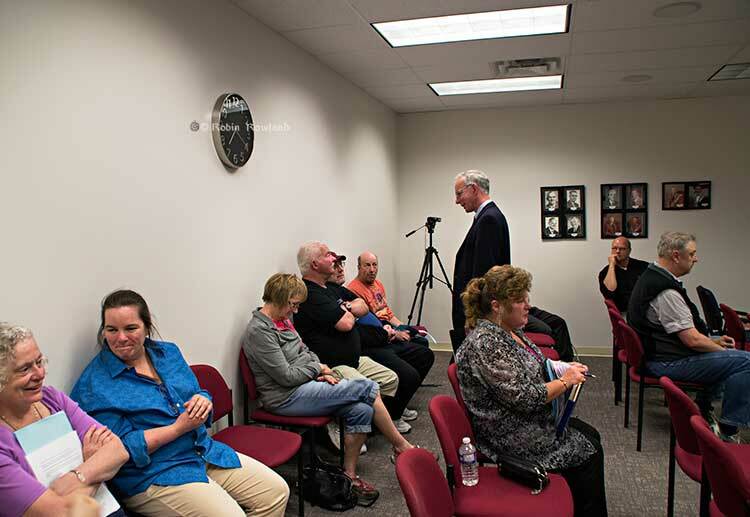 While these witnesses were reluctant to confirm that they had been prohibited from meeting with us, they repeatedly referred to the “whole-of-government” approach to consultation as their reason for not meeting. Canada’s “whole-of-government” approach clearly limited engagement to a strict process with no opportunity for real engagement. It is clear that the Haisla Nation that we are the very earliest stages of consultation with Canada about the proposed project….It is clear to the Haisla Nation that the 45-day period within which Canada has unilaterally determined face-to-face meetings with all the Aboriginal groups potentially affected by the proposed project will occur is not an adequate amount of time to complete a meaningful consultation process. The Haisla Nation response to the federal government’s request for consultation on the Joint Review Panel report on the Northern Gateway lists what the First Nation sees as flaws in the panel’s assessment of the project. (The Haisla filed their first list of flaws in the JRP in a court challenge). In the response, seen by Northwest Coast Energy News, the Haisla are objecting to both the government’s and the JRP’s attitude toward the idea of consultation as well as some of the specific findings by the panel. The Haisla also fault the JRP process for refusing to take into consideration reports and studies that were released after the evidentiary deadlines. The JRP report is written in a way that prevents an assessment of how or whether the JRP considered Haisla Nation concerns and of how whether the JRP purports to address the Haisla Nation’s concerns. Further the JRP Report is lacking n some of the fundamental justification required to understand how arrived at its recommendations. So what are the Haisla concerns? The proposed project carries with it an inordinate amount of risk to Haisla Nation Territory. The Haisla Nation is being asked to play host to this proposed project, despite the risk the proposed project poses to the land waters and resources relied on by the Haisla Nation for sustenance and cultural heritage. The risk includes a huge risk to Haisla Nation aboriginal rights to trap, hunt and fish, to gather seafood and gather plant materials. It could result in significant damage to the Haisla Nation cultural heritage—its traditional way of life….. The terminal site is one of the few areas suitable for terminal development in our territory. It is also home to over 800 Haisla Nation Culturally Modified Trees (CMTs). Northern Gateway proposes to irrevocably alter the land, the use of the land and access to this land for the duration of the proposed project, which is anticipated to be at least 80 years. This irrevocable alteration includes the felling of our CMTS…. By seeking to use Haisla Nation aboriginal title land for the proposed project, Northern Gateway will be effectively expropriating the economic value of this land. Northern Gateway is proposing to use Haisla Nation aboriginal title land for a project with no benefit to the Haisla Nation and which is fundamentally at odds with Haisla Nation stewardship principles. Fisheries and Oceans did not have a mandate to conduct an assessment of the potential toxicological effects of an oil spill. Environment Canada did not review or provide information on the spills from pipelines. The federal government witnesses were unable to answer questions about the toxicity of dispersant. Environment Canada was asked if it had studies of the subsurface currents and the movement of submerged oil. Environment Canada told the JRP did not measure hydrodynamic data but relies on DFO. DFO cold not provide any witnesses to the JRP with expertise on subsurface currents. The JRP has concluded that the risk of a large spill form the pipeline in the Kitimat River Valley is not likely, despite very significant information gaps relating to geohazards, leak detection and spill response. The JRP has concluded that a large spill would result in significant adverse environmental effects. However, the JRP appears to base a finding that these effects are unlikely to occur on an unreasonable assumptions about how widespread the effects could be or how long they would last. The JRP has not considered the extent to which a localized effect could impact Haisla Nation. The JRP relies on the concept of “natural recovery” as mitigation of significant adverse effects. The Haisla Nation asked the JRP to compel information from Northern Gateway about the applicability of its evidence to species found in Haisla National Territory. The JRP, however, refused to compel this evidence from Northern Gateway. 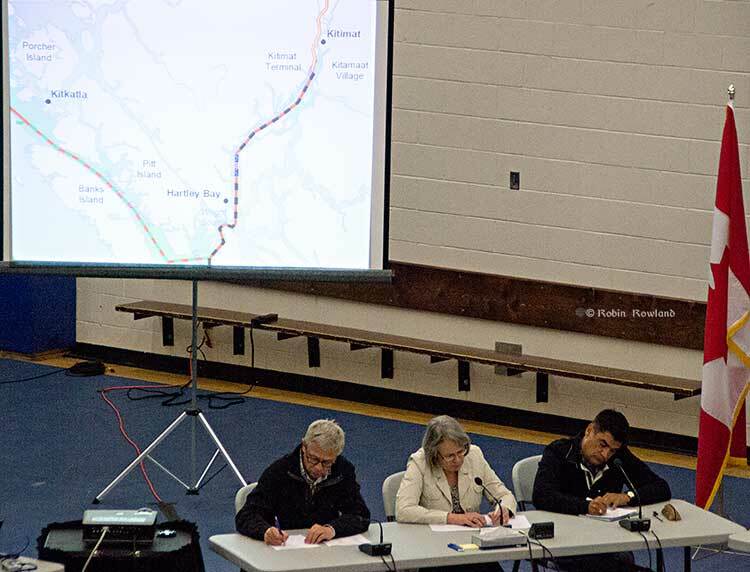 The JRP has accepted at face value that Northern Gateway would shut down its pipeline within 13 minutes in the event of a rupture and has failed to consider the effects of a large spill that is not detected with this timeframe through the control centre (or was in the case of Kalamazoo, is detected by the control centre but is systematically mischaracterized and ignored). As part of the consultation process the Haisla want 22 changes to the JRP report, changes which echo the Haisla Final Written Argument that was filed at the end of the hearings. The Panel should find that potential impacts to asserted Haisla Nation aboriginal rights and title from the proposed project are such that project cannot be found to be in the public interest in the absence of meaningful consultation… The current status of engagement and the federal government imposition of a 6-month time limit to complete consultation raise serious concerns that meaningful consultation will not be possible. Therefore the proposed project is not in the public interest. The JRP should have determined the significant of adverse effects to rare ecological communities that cannot mitigated. The JRP should have provided more information to allow a reasonable assessment of the risk of a spill from the pipelines. The JRP would have considered all factors to contribute to the risk of a spill. The evidence had not demonstrated that Northern Gateway’s spill response would be able to mitigate the effects of a spill either at the pipeline, at the Kitimat marine terminal or from a tanker spill. The JRP did not consider the impact of the Kitimat Marine Terminal on their cultural and archaeological heritage, including culturally modified trees. JRP chair Sheila Leggett’s constant citing of rules of procedure and her stubborn refusal to consider new evidence and studies in a dynamic situation that was changing rapidly was one of the reasons that many people in the northwest said the JRP had lost credibility. Canada needed a much more rigorous regulatory regime covering tankers. There are uncertainties on how diluted bitumen would behave in a marine environment. Dispersant may not be effective. The physical properties of diluted bitumen “fluctuate based on a number of factors.